Translation: "At the Shrine Gate"
I should have waited till Halloween, or at least the autumn equinox to submit this, but heck, I'm not one for patience. (*~.^*) Yay, I finally did those multi-colored clouds that look so cool on everyone else's wall (don't ask how long it took me to figure them out, it's embarassing...)! Many thanks to Silvandragon17-san for the awesome Battousai scan! The torii and the shrine are from the Stock Exchange. Super cool. I really like Kenshin. :) It really looks like if he's waling down steps. Excellent!!!! Man, i've been looking for a descent scan for the battousai!!! THIS ONE IS awesome!!! so umm, did u only do the clouds? everything else is a background u got from somewhere? neway, whatever u did, nice job man, i really admire this wallie....keep up the good work.....+Favs. I like the effects of what you did with the clouds/mist. It really adds to this atmosphere. I also like how you chose the right color combination for the clouds/mist--it matches to his hair. And the moon is done so nice--looks so mysterious. The background is beautiful--it really makes me feel like I am at the Shrine. And the mood of the wallpaper is just right too. I must congratulate you, sylvacoer-sama! Yes, you are a true master! A great artist! :D I love what you've done with the background. It's simply incredible! Awesome effects! The clounds and the shine on the katana! Pretty good wall. I'm especially fond of the bg, which looks really good. One thing that bugs me is those pixels of random colors over the temple... And one thing that I can't help, but feel is that Kenshin doesn't seem to be standing on the stairs O_o Maybe it's just me, though. Still, pretty good wall. Going to favs. Another amazing background from you! I really like the quiet and mysterious atmosphere you achieve using those marvelous colors! It's a beautiful wallpaper no doubt, a truly wonderful one for the battousai! You're becoming a really awesome waller, girl! XD Your bgs never ceases to amaze me. One thing that doesn't feel right is the trees. In comparison to the scan, they don't match too well. They feel more real. Does that make sense? O_o If it doesn't, it's okay. The temple and the sky looks fine and blends in well. Love the details in the steps and how you made them slightly serve to fit Kenshin's footfall. Really amazing work! Awesome wallie, sylva! (Sylva is such a great artist, XD ) Kenshin really looks like he's walking down the stairs!! 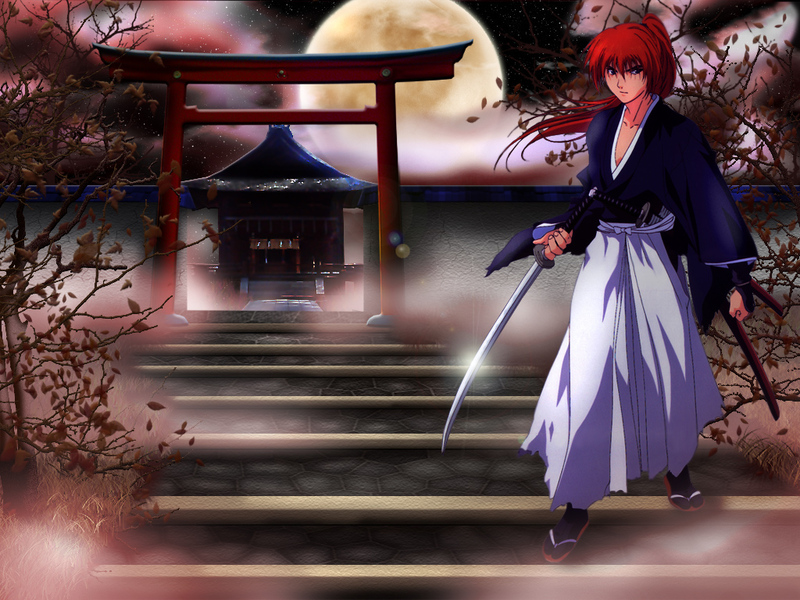 Oh, redhead... no wonder you're making a wallie out of him, I mean uh.. Kenshin. ^^ The gates are awesome!! I really like that huge gates. The background is just simply wonderfuly, but I see some pixelated dots on the shrine.Why issit like that? Overall, great wallie. Just that maybe you can fix the pixelated dots on the shrine? Quote by EmmaI like the effects of what you did with the clouds/mist. It really adds to this atmosphere. I also like how you chose the right color combination for the clouds/mist--it matches to his hair. And the moon is done so nice--looks so mysterious. My exact words/thoughts. Very good work sylvacoer! This is one of the best kenshin walls I have seen in awhile. THe bg is awesome dude. Spiffy, excellent work on the whole thing. You even have details in the moon and trees, nice thank you for not waitting. this is great the details are what impress me you even have the pegs holding the shrine together. cool, very cool. This picture never gets old, it's great, nice background too, nice wall overall! XD Wow! I have been looking for a really good wall of Kenshin! XD It was so incredibly detailed and nicley contructed! ^_^' The glowing fog highlights several areas of the wallpaper bringing the eye all over. :o You made Kenshin look like he is coming down the steps. >_< The temple shrine matches perfectly. OX The tints of blue and red in the fog and on the building match well with Kenshin. ;) I like the wall, blades of grass, leaves, and moon added details. :pacman: Wonderful, thanks for your hard work and I look forward to seeing more of your art around MT!